Here's a piece of news that should shock no one who has visited this blog on a somewhat regular basis: I've been interested in--some would say obsessed with--Japanese culture and video games for a very long time. As for what the first issue of Nintendo Power has to do with all of this, well, if memory serves, the article above--which I just scanned from said issue--is what prompted me to fall in love with the Land of the Rising Sun in general and its video games in particular. Assuming at least some of you have a similar fascination with Japan and its games, what pushed you in that direction? Also, I loved the Mario, Zelda, and Super Metroid monthly comics so much which were all drawn by Japanese mangaka! I wish the collections of these comics were easily available as I only have the Link to the Past one. Hey there, Kaze! Glad to hear from a fellow Nintendo Power fan :) Of course, how could you not be a fan of that great mag, right--especially if you were lucky enough to start reading it early on in its life? I loved the comics featured in every issue, too, by the way. I should flip through some of my copies and see which comics I have access to. Maybe I could scan some of them for you? Aw, that's very kind of you to offer, but I wouldn't want to make you do all that! ^^ Besides all the comics are scanned and uploaded online if I wanted to track them down. 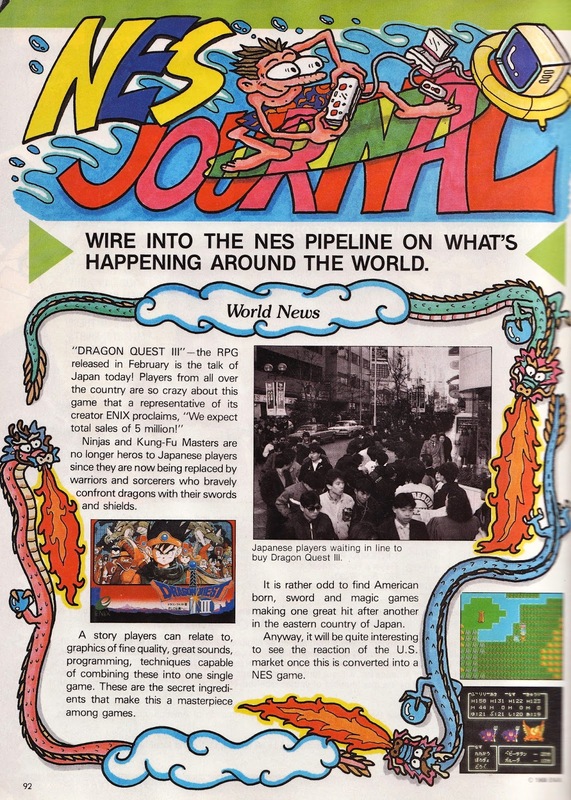 Researching any history i could find over the years about my second big obsession (He-Man & the Masters of the Universe--especially Fisto--being my first), Nintendo's wild IPs & their implementation of various facets of Japanese culture first made me aware of the great modern East. Studio Ghibli films also made a huge impact on me, first with the original English dub (not with the garish Fanning sisters' dub) of My Neighbor Totoro, and looking deeper into the films led led me deeper still into Japanese way of life and history. Love. Thanks for sharing this, John! Would you believe I've never seen a Studio Ghibli film? Sad, I know--especially given my love of Japan and pretty much everything related to it. I guess I should rectify that soon. I don't suppose you have any recommendations as to which Ghibli film(s) I should start with? Ah, that's a rad introduction! I don't remember which was the first time I really realized that Japan was behind Nintendo/video games, but I do remember after I beat my first Zelda (Wind Waker), I poured through the internet for months learning everything I could about the series, trying to play as many as I could. Those were great years! I sorta miss the years where things were a little more mysterious about games, though. Only getting like 4 static screenshots of a game in a magazine and going off of that for months thinking about what the game was like..
Yeah, it was a pretty cool introduction, Zach :) How funny that it was my first Nintendo Power, too--and I'm guessing my first game magazine overall? I guess I was destined to fall in love with Japan and its products. Your story is great, too, though! I love that Zelda was the game that prompted you to dig further into the series, Nintendo as a company, Japan as a country, etc. And, yes, I kind of miss the years when we had to rely on gaming mags for our info, but only just a bit. It's so nice to have access to that info so much sooner these days. Plus, it's not like the Internet has ruined the mystery completely. Take my interest in the GameBoy, for instance. I'm still discovering new gems for that system, and it was released decades ago! I remember this article! It was just a blip on my radar at the time though! The one that got me more aware of Nintendo as a Japanese company was when they did a little "behind the scenes" on Mario 3 which showed how they made some of the graphics for the game and even a little interview of sorts with Miyamoto. It was the first time that the magazine had ever focused on a developer at all, and definitely the first time I saw anything like it. What pushed me towards Japanese culture awareness and fascination was EGM, which had a substantial focus on import games at the time (1991), and even covered games based on anime like Ranma 1/2, and I was just really fascinated with everything. So that pushed me into exploring both anime and eventually importing games. Also the Die Hard Gamer's Club ads (before Gamefan became a "real" magazine!) that EGM ran were like a treasure trove of Japanese items. I used to pour over those as thoroughly as any article! Agreed on all counts, Zach. The fact that Nintendo is slow-dripping the Wii's VC library onto/into the 3DS and Wii U is the definition of frustrating. But even if they released everything en masse, as they should have from the start, there's still the issue of no cross-play for these games and systems, which is a big missed opportunity, IMO. I also think Nintendo really leaves a lot of money on the table by not marketing the Virtual Console separately/specifically. There are a lot of folks in the US, especially, that would respond to such efforts, I believe; people who owned NESes or SNESes or GameBoys or whatever and who would seriously consider buying a 3DS and/or a Wii U if they knew they could play all of their old favorites on those systems. Totally true! Especially in light of the burgeoning interest in Japanese games. Related: I actually just bought a Japanese 3DS the other day so I could continue to find all sorts of gems, and I'm super excited about the totally unknown territory I'm about to descend into! So I guess you're right about having more info too; we wouldn't be quite where we are now with the games industry if they'd continued to show up randomly in Babbages and dusty corners at Toys R Us. It's a precursor to the WipeOut series, happening a few years before the very first game on Playstation and Saturn. Things that were sleek and futuristic in the other WipeOut games have a rusty, dreary look, suggesting a transition from combustion engines to hovercraft racing. There's even an introduction which illustrates 150 years of advancement in professional racing. You may recall that there's a similar timeline for exploration in the Star Trek: Enterprise opener. Finally, it stinks, just like Enterprise! It runs entirely too quickly for the player to keep up, and the darker color palette keeps onscreen objects from "popping" like they did in previous games. The end result is that you frequently find yourself crashing into and rubbing against the sides of the track, while your opponents zip past you. The load times are also the pits. The thirty second waits between races (that you'll lose anyway) will make you want to punch a wall. Most reviewers (cyborgs, I suspect) were happy enough with the game, so your mileage may vary. However, I played the game on two separate occasions and was bored and/or frustrated both times. It's free with a PS Plus subscription and it STILL wasn't worth the space on my memory card. Take Mario Kart. Double the speed, set it in the future, and change all the racers into wedges. That's pretty much the game right there. Hey there, Michael! Oh, it seems you and I had lots of similar experiences growing up (although I think I'm older than you?). I mean, yes, the article showcased in this post was the starting point of my Japanese obsession/interest, but like you said, EGM and some of its spin-offs (did you ever read Super Play?) and, later, GameFan were the mags that really brought things to a head for me. And, YES, those Die Hard Gamer's Club ads in the back of EGM et al were AMAZING! Even just seeing black-and-white screenshots of certain games (that had yet to be released in the US, of course--some of which never came over at all) was enough to send me over the edge back then. Wait, which system did this game appear on? I thought the first WipeOut game was on the PS1 and Saturn?? Ha ha, yes, exactly! Also, congrats on the JP 3DS! Have you bought any games for it yet? Ooooooh, right! I feel like I've heard of the game now. Of course, hasn't the WipeOut series been going downhill for sometime now? if so, that's too bad, because I remember finding the first ones pretty appealing back in the day. It's really aggravating using the Wii features on the Wii U. The screen is blurry, the game pad only works as a display, and some Club Nintendo games have to be registered in Wii mode, which is a colossal pain. I'm amazed at just how antiquated the Wii interface looks and feels in 2014. The people who complain about the Wii U game pad really need to take a step back in time and realize how good we DIDN'T have it eight years ago. Nope! Not yet. I'm using it as incentive to keep up with my Japanese studies--you were the one that I talked to about TextFugu a while ago, right? Or I saw you talk about it? Anyway, I'm doing that. I'll probably nab Smash when that comes out and a few little VC games with light text, but I'm really hoping to eventually get into Yokai Watch. It looks so... dreamy. Everyone seems to have a different opinion on the subject, I think. I don't like 2048, but did think the first PSP WipeOut was pretty enjoyable, and worthy of the name. Sony's decision to kill the Psygnosis brand did serious damage to the WipeOut series, in my opinion. It was senseless to retire a publisher that was damned near a legend in the business, especially in Europe. At least the two companies responsible for Psygnosis' best games (DMA and Reflections) still exist, albeit with different names. I never read any of the spin-offs! I was a Genesis kid so I think Mega Play is the one I would have been reading if any of them, but I don't think any newstands in my area ever had any of those, anyhow. And yeah, it was neat at the time but I don't miss calling in for games! Online is much easier. Besides that, when online shops like NCSX (there was another one that I ordered from frequently as well but don't remember the name, it isn't around anymore) popped on the scene I was blown away by how much cheaper everything was, I guess those fancy print ads weren't cheap! And yeah for some reason I think you're just a couple years older than me. I forget why I know that! Yep, Mega Play was another of EGM's spin-offs. There may have been others, too, but I can't remember right now. Anyway, I was able to find them somewhere local as a teen, although I can't remember if it was the grocery store my parents have always used or, more likely, store like Walden Books, etc. So, visiting the Die Hard shop wasn't all it was cracked up to be? That's too bad. Hmmm, that does seem weird! Did Sony ever explain why they did that? Even just keeping the name in Europe may have been a wise idea, if you ask me. Well, I can't speak to much of what you say here, Jess, as I've yet to own/play a Wii U (outside of that preview event I attended long ago). I will say that I rather liked the Wii OS at the time, but I definitely can see how it would be considered a bit ... archaic now. Hey, and there's nothing wrong with that! Yeah, I've heard it's great for beginning learners of Japanese since it's essentially like Pokemon, with easy words and lots of furigana to help out. So I'm stoked! Also: Level 5 has said they're working on it I thought? The localization? But I'm worried about how niche it might be as it heavily relies upon knowledge of Japanese customs/culture. I'm not sure what it had cracked itself up to be in the first place tbh (I don't know what I was expecting). It was neat to see some import games in person (and they had a couple arcade machines) but it was a pretty normal-seeming shop, and didn't have the volume I had come to expect from the ads. Nothing like Pink Gorilla, for instance! God...I remember when they announced Ufouria in that column. I clipped that page and put it on my little bedroom wall, and then I waited more than twenty years to play it when it was released as an import on the Wii's Virtual Console. Hello again! Sadly, as far as I'm aware, L5 have NOT yet said they are working on a localization or anything of the sort as it relates to Yokai Watch. I believe they have done/said/tweeted a few things to suggest they're working on it, though, but that's not quite the same thing, as it requires us to guess, make assumptions, etc. Anyway, hopefully they or Nintendo will clear the air soon in this regard. Oh, yeah, they announced or revealed a lot of interesting games in this column over the years, didn't they, Justin? BTW, you know what? I still haven't played Ufouria--or at least I don't think I have. What do you think about it? Did it at all live up to your hype for it? Me neither :) When I was that same age I'm pretty sure a place like Pink Gorilla would have blown my mind! Selling used games probably gives them an inventory advantage (I think Die Hard only sold new ones). Ah, yes, you're probably right about selling used games helping out these days. Even then, though, it's kind of hard to imagine how shops like Pink Gorilla can stay afloat. I have to imagine sites like eBay and even Craigslist put a lot of pressure on them from a pricing perspective. Oh, I loved it! I thought the character swapping and puzzle elements made for a great little game. And it wasn't too tough, but wasn't too easy. I can't let this sit unanswered! :) Keeping it brief, Totoro, Kiki, and Spirited Away are hard to go wrong with, but my personal favorites are Laputa/Castle in the Sky and Porco Rosso. Laputa is a very charming and archetypal "adventure anime" and Porco is a post-WW2 Italian airplane romance--there's something for everybody! Really as long as you aren't watching Tales from Earthsea (which is awful) there's no wrong way to get started. Funny story... I used to be friends with a Thai kid when I was a freshman. Occasionally I'd come over to his dorm and crash, digging through some of his Japanese comics. I stumbled across an issue of Dragonball (not Z) and said, "Wow, this reminds me of this game I played on the NES a year back... Dragon Power, I think." He responded, "Yeah, it was probably a Dragonball game they changed for the United States." Now I realized that NES games were designed almost exclusively in Japan, but I didn't understand the concept of localization; that the games released in the United States were changed from their Japanese counterparts to appeal to an American audience. Discovering the Dragon Power/Dragonball connection was a real game-changer for me. Ah, yes, I remember that, too, Jess. I didn't learn of Dragon Power's origins for a number of years after the fact, if I remember correctly. Kind of funny to imagine that happening today, isn't it? A minimally-invasive medical procedure went somewhat awry and I was immobilized for a few days in high school, sentenced to a lot of spare time near a computer with my foot in a tub of salts. That's when I discovered SNES/SFC emulation, and with the time to try out just about anything that had ever been released, I just went down the list, one 56Kbps download at a time. (Direct links on an ad-free site, without so much as a hand-waving legal disclaimer... hey, I was naive, and it was a different time.) When I ended up firing candy bullets at a cat-headed pirate ship with a penguin, I couldn't do anything else for days. I was always aware that most of my favorite games seemed to come from Japan, but it didn't turn into an 'obsession' until Parodius. Yeah, it was Parodius Da! I've played them all, and that one's still my fave, maybe because I played it first. But I also have a special place in my heart for the Famicom version of Parodius, which a friend brought back for me from Japan and which I eventually bought a Famicom to play. It has a unique amusement park-themed stage, and is a technically impressive achievement for that system. Check it out, if you haven't! Oh, I've played the Famicom version of Parodius, and I like it well enough. It's probably my least favorite of all the Parodius games, though. Oh, and, YES, your friend sounds like quite a friend indeed! Yeah, it was SFC Cameltry! When I sold most of my game collection to pay for another medical procedure-- don't worry, I have insurance now, haha-- that's one of the few items I kept, and the awesome box art had a lot to do with it. Nice choices for games! As a Wario fan, I agree entirely with your comments about Wario Land 7 and WarioWare for 3DS, and I'm honestly surprised neither have yet to materialise in the first three or so years of the consoles existence. After all, is Augmented Reality an obvious feature to based a few WarioWare microgames around? Super Princess Peach 2 is a nice idea as well. And though I didn't really care for the original, I think I might be more likely to try a 3DS sequel, especially if ups the difficulty, increases the amount of content and just turns out to be as good as the other 2d Mario titles. Thanks, CM30! I'm especially shocked by the lack of Wario games of any sort, I have to say. Maybe Nintendo's just decided that the games aren't as worth the effort as they used to be thanks to the general downturn both series have seen in recent years? As for Super Princess Peach 2, I agree with you that a sequel really should be more difficult, along with otherwise offering more content. Here's hoping we get just that eventually!